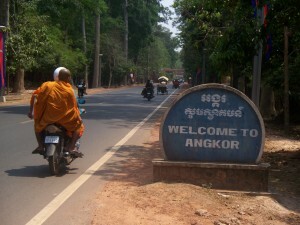 On our first day we decided we would take a Tuk Tuk to the entrance gate for Angkor, then walk the rest of the way. From the ticket office, it is about 3km to Angkor Wat. This walk was ok and we were ok walking around Angkor Wat. However if you are wanting to try and fit other temples in to the same day, I would suggest you hire a tuk tuk for the day. The distance from Angkor wat to Angkor Thom is a further 2-3 km. If you have only got a short time, make sure you definatley fit in Angkor Wat and Angkor Thom. On our second day we hired out bicylces for $1, from the city center. This was a great way of getting round, as we were able to do things at our own pace and see as many temples as we wanted. There is so much to explore, that it is impossible to see everything in just a day. We had a 3 day ticket and we still didn’t get to see everything. There was so many un even stairs to climb, around the temples. If you are at all afraid of heights, you would find climbing the temples difficult. However there is still plenty to see without climbing.I was a little uneasy coming down the stairs of the temples, as they are so narrow and un even. Sorry this blog is so short. We just wanted to get something up about the temples, as our last blog kind of got in the way. Although we had a bad experience in Phnom Penh, we want everyone to know that Cambodia it self is a beautiful country and we are glad we visited Siem Reap, especially. Please take a look at our photos. Monday morning at 6.30am, the alarm went off to wake us up. I woke up feeling confused and worried, but knew I had to be strong today. Somehow I managed to get the strength and remain calm. We got ourselves ready to go to the police station. The phone in our room rang around 7.15 am, whilst Paul was in the shower. I answered and the lady in the reception told me that my friend was in the reception and wanted to talk to me. I told Paul to get ready as quick as possible. I went down alone to see who it was. I thought the receptionist meant they were actually sitting in the reception, but she meant on the phone. The receptionist said that a lady had called for me. She had to call her back and she said she had hung up. It was a woman. She couldn’t speak much English, so it was hard to understand. She said that she wanted to meet me to tell me her story about my bag! I didn’t understand what she meant. I thought maybe she was trying to say that she saw my bag get stolen, but then I thought how would she know I was staying at this hotel. I asked her if she had my bag, but she just kept saying I want you to come to my house to hear my story about your bag and how you lost it! I asked the receptionist at the hotel to speak to her as the lady didn’t speak much English. She explained on the phone to the receptionist, that she had my bag and wanted to give it back to me. She had found a receipt for the hotel in our bag, which is how she was able to contact us. The receipt had our room number on. I asked if she could bring it to the hotel, or the police station, but she said no, because she was too scared in case the police thought it was her that stole my bag. She wanted us to go to her shop/house and collect it there. The receptionist took down her address and phone number and said that if I went to her home, she wanted to talk to us and tell us how she found my bag. Then the receptionist said would you give her a tip or something for finding it. I thought it was a bit strange that the receptionist was telling us to give a tip, but we didn’t really think much about it at the time, as we were just glad she had my bag and our passports! Another guy in the hotel asked us if we had been to the police yet. When we replied no, he then told us that the best thing would be to take a taxi, with the hotels taxi driver and go to the ladys shop. We were anxious and worried about doing this, but we didn’t know what else to do! He rang up the lady getting more details about what was left in the bag and double checked our names matched the names on the passports. He then said to us it will take you at least 30 days to get a new passport, so it is best for you to go and talk with the lady. He said my taxi driver will take you to the shop and Wait with you and bring you back. I didn’t trust this guy at all, there was just something about him, but were stuck with what else to do. We needed our passports back! If we went with the police we were scared she wouldn’t give them back, or deny she had them, and she wouldn’t bring them to the hotel or the police station, so we felt we had no other choice. So we went with the hotels taxi driver to the Lady’s shop. It cost us $15 for the return journey, plus for the taxi drivers waiting around. We were driving in the taxi for about 10 minutes, when we stopped on a remote street. There was no traffic in front of us so we were wondering why we had stopped. The taxi driver made a phone call and was speaking to someone in Khmer (Cambodian). I really wish I was able to understand the language, so I could of known what he was saying! Paul then asked him if we were there. He said he tried calling the lady but she didn’t answer. I don’t know whop the person he was talking to then? I don’t know why her not answering the phone would stop us from driving, because the taxi driver already had the address of her shop. I started feeling unsteady about the situation. The taxi drivers phone rang again. He spoke briefly to someone, who I believe to be the lady in the shop, as It was a woman speaking. He put the phone down and then drove on. We passed a shop within seconds of driving. There was 1 lady and 4 men starring into the car. We thought that must be the shop. The taxi driver pulled up just passed the shop. We both got out of the car and the taxi driver followed us in. The lady and men in the shop were really happy to see us and were smiling and waving. They welcomed us into their shop, where they had two seats waiting for us to sit on. The lady went to get my bag, and showed us the passports left in the bag and my visa cards, driving licence and a few pieces of ripped paper. She handed me the passports for a while to let me flick through them, making sure all the visas were still in there. I think what has happened is who ever stole it from you, just took all the valuables, then left the rest. My Ipod Touch and a few other small things had been taken from the bag, but the important things were left. He then picked up my two visa cards, saying it’s good that they have left these for you. I picked up my visa cards and me and Paul snapped them in half, as we had already cancelled them with the bank last night, so thy were no use anymore. The lady and son were confused as they watched us snap them into pieces. She finally understood that they were no longer working. She then asked me how my bag was stolen. We explained that two guys on a motorbike had pulled it off my shoulder. She then showed me the bag. The strap had snapped on it, so that’s how it must of come away from me. I had it over my neck, so I wondered how they would of got it off me, but it looks like when they pulled it, it snapped. They then wanted to show us the back of the shop, where they had found my bag last night. There were pieces of paper from my bag on the floor, including ripped receipts. I thought it was strange that the pieces of paper were ripped. I started to notice that we had been at the shop for nearly 15 minutes and the lady was still holding my bag. This was strange. If she wanted to return my ag, she would of handed it to me by now. I felt really uneasy and wanted to get out as soon as possible. The lady, her son and the other 4 men took us back round to the front of the shop. They told us to sit back down. They were just smiling and looking really happy. You would think this was because they had found our bag and were able to return it to us. Paul got his wallet out to give $20 as a tip for finding the bag. Paul emptied his wallet in the taxi, taking all his debit cards and other money out and he put them in his pocket. I quickly noticed the sons face as he looked at the money Paul was offering. I knew for sure that things weren’t right and that we had to get out quickly. The lady wasn’t taking the $20, she was shaking her head. For a moment Paul thought this was just because she didn’t want any money at all, but I knew that wasn’t it at all! He also blocked the door way not letting us out. Paul was behind me at this point. Whilst me and the lady were fighting over the bag, Paul realised we needed to get out and that there would be no reasoning. He quickly grabbed back the $20 and put his wallet safely away. I was still trying to get the bag back at this point. She had a strong hold of the strap around her hand. Paul began pulling it with me and luckily the strap snapped off the bag, allowing me to have full hold of the bag. I transferred the bag over to Paul as he was closer to the exit. The son kept telling me it’s ok and just sit down and stay calm. I knew not to trust him and just get out. Paul waited for me to get out. The lady was still trying to get the bag back, so I pushed her down to the floor and barged past all 4 men and the taxi driver, who were all blocking the way. One of the guys was pulling onto Paul’s Tshirt not letting him get out. Paul elbowed him in the stomach, whilst I pulled Paul by the arm. We were out, with the bag! We ran as fast as we could. I stopped in a garage asking for help, as I could see the lady and son on a motorbike behind following us. I shouldn’t of stopped, it was no use! No one spoke much English and no one was helping, just starring. The lady caught u with me on the motorbike. I had my bag in my hands, but Paul had already taken the passports out and put them in his pocket. The lady got off the motorbike and grabbed hold of my hair. I was asking the men in the garage for help, but they just starred. Paul ran back and grabbed the ladies wrist and pushed her away. We kept running, but they were still following us on their motorbike. We saw some police officers in the distance and thought, great they will be able to help us! The lady raced ahead on her motorbike and spoke to the police officer. I don’t know what she said, but the police officer wouldn’t speak with me or listen. We soon realised that even the police weren’t helping, so we just continued to run, with them still chasing us on their motorbike. We came to a big junction where the police were closing the road for someone important coming. This was to our advantage as they were no longer able to follow us on their motorbike. We kept running as fast as we could. Once we got away, we decided to try and stop another police officer, but he just pointed to another police officer in the distance and said you need to speak to him. Other police were just laughing.We don’t know what was going on, but all we knew was there was no point asking any of the police for help! So we just kept running. We didn’t know where we were, but we had a map so Paul managed to locate where we were, and get us back to the Asia Hotel. It was about 10am by the time we got back to the Hotel. We walked in shaking and sweating. Our adrenaline certainly kept us going! We were just glad to be back with our passports! It was a miracle that we had them back! We went straight up to our room. We didn’t want to talk with any of the hotel staff, as we didn’t feel we could trust them! The guy who organised the taxi for us and told us the taxi driver would come in with us and wait for us, knew what was going to happen, I’m sure! The taxi driver was a part of it. He had tried to block us in the shop and demanded I sit down, when I tried to run away. We locked ourselves in our hotel room and packed our bags up and got ready to check out. It’s ok now, you don’t have to worry, they have gone, you can come down now! We were thinking how did he know what had happened. We hadn’t spoken to him or any other member of staff since coming back into the hotel. We didn’t trust him at all! We finished packing our bags and made sure we had everything. We then went down to reception to check out. We had already paid for the hotel, so all we had to do was hand our key in. The same guy who had organised our taxi, was at the reception desk. He asked Paul where we were going. As if we were going to tell him anything! You ran away, so he couldn’t bring you back! Of Course I ran away. He was trying to block me in the shop! Wait! We need to check your room and make sure everything is still in the mini fridge! After all that had happened to us and after paying for a taxi, who had demanded we sit down and don’t leave the shop, all this man cared about was if everything was still in the mini fridge! We just walked away. We hadn’t taken anything out of the mini fridge! We found another really nice hotel and settled into our room. We were just so happy to have our passports back. It was a struggle to get them, and was dangerous. We certainly don’t want to go through anything like that again! We were also so happy to be out of the Asia Hotel. We didn’t feel safe there at all and we didn’t trust any of the staff! At least now we have our passports and can leave Cambodia! Some Websites we wish we had read before! Thanks for reading. We are both safe now and continuing our travels. We are heading back to Thailand today. We were meant to be going to Vietnam, but we don’t want to wait around in Phnom Penh for our Vietnam visas. We may go to Vietnam at a later date. You may want to sit back, put your feet up and relax for this next blog, as it may take a while! Sunday 2nd May at 8.30pm, me and Paul left the Asia Hotel, in Phnom Penh, to go to get something to eat. We were heading towards the river front. We had been walking for about 5 minutes, when we got to Preah NorodomBoulevard. We stood on the pavement waiting to cross the road. We stood forward getting ready to cross. Then I noticed in the corner of my left eye that a motorbike with 2 people on, was coming very close to me. I tried to stand back quickly, but before I could, I was knocked back. Paul started running, as he could see they had taken something from me and also thought that they had hit me. I quickly noticed that they had my bag in there hand. I started running up the road and shouted to Paul. They have my bag, and it has our passports in! I was running behind Paul as fast as I could. I was shouting help and I finally came across some young guys on motorbikes, from Cambodia, who stopped. They didn’t speak much English, but they were able to understand that my bag had been stolen. Paul was still running at this point. He got close to them, and could see that they had turned right at the lights, but he couldn’t keep up. They were on a motorbike after all! The young guys told us to get on their bikes. They told us they would try and help us find them. I guess we didn’t know weather we could trust them or not, but at this point, we didn’t know what else to do. We got onto their motorbike and followed in the direction that the thieves had gone. They were well out of sight by now and the chances of finding them were small. They drove us to the nearest police station. The police didn’t speak much English, so the young guys explained what had happened. I’m not sure why, but they were unable to help with the situation. I thought that’s what police were for, but I was wrong. They continued to drive us around. They took us to a man on the street who spoke good English. He told us that going to the police wouldn’t help much, but that we should go to the British Embassy first thing in the morning. He tried to reassure us and tell us everything would be ok.
We started to realise that looking for them wasn’t going to help much. So we asked if they could take us back to our hotel. They kindly drove us back to the Asia Hotel and we thanked them for all their help. I had shouted for help so many times. So many people just stopped and starred, but these guys genuinely wanted to help. That meant a lot to us! We got back to the hotel about 9.30pm. I was feeling very distraught. I was crying wondering what we were going to do. No one, not even the police seemed to be able to tell us what we could do. In my bag was mine and Paul’s passports, my wallet with all my bank cards, driving licence in. A few coins, but not much money at all, maybe 2-3 pounds in total, which was good. Also my IPod touch was in the bag, and a few other things which I couldn’t remember at the time. It was annoying loosing my IPod Touch, but our passports were the main thing! We couldn’t go anywhere without them. We have a safe deposit box for each room, here in reception, for you to keep passports and belongings in. I was thinking, well thanks for telling me that now. That knowledge would of been good before we went out! Tell your wife not to worry, this happens all the time in Cambodia. Passports are stolen a lot! This wasn’t helping either, or making the situation any better! We just wanted to report it to the police an see if anything could be done. We asked one of the members of staff to call the Police for us, he said it was late and would be better if we waited till the morning. It was only 9.30pm. We didn’t want to wait till tomorrow. I asked again, making it quite clear that we wanted to speak with a police officer tonight. He finally listened and called the police. A police officer was at the hotel within 10 minutes. He took down the details of the incident and said that if we wanted the police to deal with it, we would have to go to the police office either tonight or tomorrow. We said tonight. The member of staff from the hotel was translating for us, as the police officer didn’t speak much English. He told us that no translator was available till the morning. We didn’t know what he was translating, but he said that the police officer had said it would be best to go in the morning at 7.30am. We agreed, not knowing what else we could do! The police officer told the member of staff to write down the address of the police station. He gave a card top Paul with the address on. Paul decided to check with the police officer if this was the correct address. He shook his head and went over to him. I’m not sure what had happened as they were speaking Khmer. I guess he had wrote the wrong address down or something, as the police officer scribbled the address down and wrote the correct address down. The police officer took Paul on his motorbike to show him the police station and also got Paul to point out where the bag had been stolen from. I went up to the hotel room waiting for Paul to return. I was hoping and praying that a miracle would happen, and that he would return with my bag with everything in, but he returned with only his broken flip flop, that had fallen off his foot when he was running after the thief’s. We both sat in the room wondering what we were going to do. We finally pulled ourselves together and managed to do the essential things. I rang up to cancel both my debit cards. Then I also realised that they had my Ipod Touch, which had my hotmail, facebook, skype and several other things on. So I changed the password on all my accounts. I noticed that I had an extra contact on my skype account, so they must of signed in for a while, but I managed to change the passwords before they could. We then looked up all the details about what to do if you loose your passport. We found out where the British Embassy was in Phnom Penh, but there was no Irish Embassy. The closest Irish Embassy was Hanoi, in Vietnam. Paul would need to apply for an exit visa from Cambodia, a temporary passport and then he would need to go to Hanoi to get his full passport. I needed to go to the British Embassy in Phom Penh and apply for a new passport, which costs $202 andcan take up to 30 days to receive. Then I would need to apply for a new Cambodian Visa to exit the country, which costs $45 (even though the visa I originally had only cost $20). So in total it would cost us both around $500 for new passports andexit visas. Plus it would take around 4 weeks to get out of Cambodia and then a further 2-4 weeks in Hanoi, for Paul’s full passport. When we read all of this, we started to loose hope, thinking we would just have to go home. As it was going to cost so much. We finally went to bed around 1 am knowing we had to be up early in the morning to go to the police station. It was not a good night sleep however, worrying about what was going to happen tomorrow! On Tuesday 27th April, we got a Tuk Tuk from our hotel (Ta som) to the Angkor Check Point, where you buy your tickets. This is about 3 km from the city and shouldn’t cost you any more than $2 for a Tuk Tuk. They tried charging us $5, but I bargained them down to $2, and they were more than happy to do this. You will need to go back to the check point every day you go to the temples, to get your ticket stamped. You can hire a Tuk Tuk out for the day, for about $10. This will include being driven around to all the temples, for the whole day. If you want a guide on top of this, be prepared to pay around $15 for the day, or $3 individually for each temple, on top of transport costs. This can either be arranged before you set off, through your hotel, or when you get to the temples. It is cheaper to wait till you get to the temples to get a guide, as the hotel takes a commision on top of the guides price. The other option is to hire out bicycles and bike around the temples. 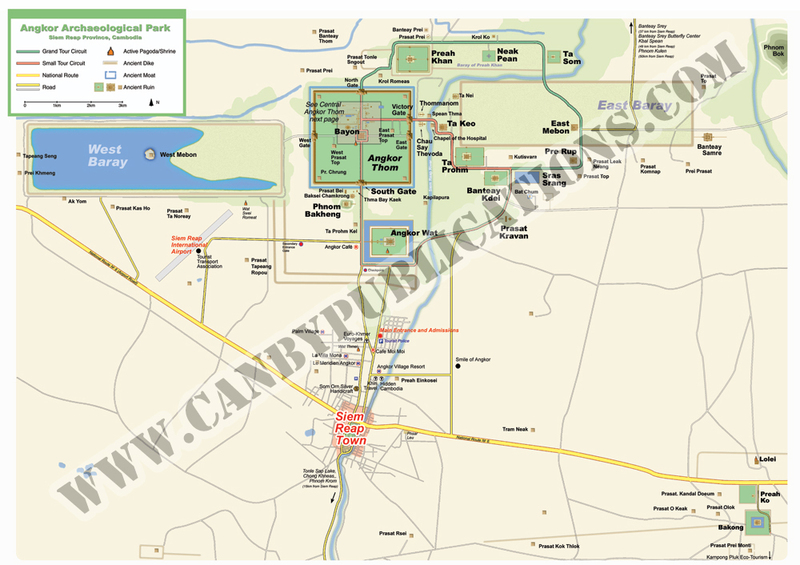 It is about 6 km from the city to the Angkor Wat Temple and a further 3 Km to Angkor Thom. We hired out bicycles for $1 each, for the day. You can pick the bike up early in the morning and drop it back off around 10 pm. We found this a great way to get around, as you have the freedom to stay or leave the temples as you please. Plus you can explore some of the other temples, close by, that tour guides will not include. Just get yourself a map of the Angkor area, a guide book, a bicycle and your off. This will cost you no more than $4 dollars each and you will have all the freedom you want! Plus it keeps you fit:) Just one tip, bring water in a thermos flask if you can. This will save you a lot of money, as they will charge you a lot more for water around the temples. However I managed to get 3 500 ml bottles for $1. They will try and charge you $1 a bottle. The ticket price for all the Angkor Temples is $20 for a 1 day pass, $40 for a 3 day pass or $60 for a 7 day pass. We got a 3 day pass. Most people told us that a 1 day pass would not be long enough. They were right. 3 days will give you a good glimpse at most of the temples, however if you want to explore them all, at a more relaxed pace, I’d say get a 7 day pass. Money for your ticket and water. We took a bus from Bangkok to Siem Reap on Sunday 25th April. Our Thailand visa ran out on this day, so it was important to leave, otherwise we would get charged 500 Baht (£10) for each day we over stayed our visa. We organised our bus with our hotel. It cost us 950 Baht (£19) each. We were in a rush to get a bus as our visa was running out. We later found out, that if we had got our bus ticket from Khao San Road, that we would of got it for a lot cheaper. It should have been about 300-400 baht (£6-£8) each. So it is best to shop around. Also remember if you get it with your hotel they will be taking a commission, so it will cost a lot more! We were picked up by a taxi from our hotel at 7 am and dropped off on Khao San Road. We had a guy following the taxi on a moped. He works for the bus company, to make sure we get on the bus. We were told we would be getting a coach, but we were led to a small mini bus, seating 12 people. We weren’t happy about this, as the mini bus option was a cheaper price; we purposely paid for the coach. We set off at around 8.00 am. The journey from Bangkok to the Poi Pet border, took around 4 hours. We were dropped off at a travel agent shop, near the Poi Pet border. We were all greeted by 3 members of staff, who gave us an arrival card to fill out and a visa form. You can apply for your Cambodian Visa on the border, so we were confused as to why we had stopped here. We soon realised what was happening. The bus company drop you off at this travel agent, where they tell you that you need to get your visa here. They charge you 1200 Baht (£24), and they drive to the border with your forms and passports and get your visas for you. We were all confused and at one point everyone from the bus, stood up and said ‘This isn’t the official place to get our visa’s’. A man from the UK was amongst us, and reassured us that it was ok as he had done this many times, and got his visa through them. He explained that they charge you a little extra, for the service of going to get your visa, but that he felt it saved a lot of hassle at the border. In the end we just decided to go with it, as the guy had reassured us. Well we got our visa ok. The guy came back on the bike with all our passports, with the visas inside. Once everyone was ready, they walked us to the border. We were told that it was too busy at the border and that’s why we have to fill our forms out with them. Well we still had to queue when we got there, and would have had plenty time to fill out two forms in a queue that we have to stand in anyway. Although it worked out fine getting the visa with them, we wouldn’t do it again. When you get to the border you can pick up the forms you need for your visa. You just need to fill in an arrival and departure card, and a visa form. You need to make sure you have two passport photos for your visa. Also take some dollars with you. The price of the visa on the border is $20 or 1100 baht .They were charging us 1200 baht . So when they tell you they are only charging an extra 100 baht it doesn’t seem so bad, however 1100 baht is $35 Dollars. So if you pay at the border with dollars, you save yourself 450 Baht ($15). These agents make sure they pay in Dollars. So in total they are making 550 Baht per application. On top of this they try to get you to take out 10,000 Baht (£200) on the Thai side of the border, we didn’t fall for this but many in our group did. They will tell you that cash machines in Cambodia only give out Dollars at a bad exchange rate. When you get across the border, they get you to change your 10,000 Baht into Cambodian Riel (at a very bad rate). They will tell you it’s the best place to change it. However Cambodia mostly deals in US dollars. Everything in shops and restaurants is priced in Dollars and all cash machines only dispense US Dollars. You will get a more competitive rate when you change your Dollars in the country and not at the border. The travel agent must be getting a commission for persuading us to change our money at the border! They were very persuasive and when I told him I was going to wait till I get to Cambodia, he said but there are hardly any cash machines and you will get a bad rate. These were all lies. There are loads of Cash machines in Siem Reap! The bus journey from Poi Pet to Siem Reap took about 4 hours. We stopped half way at a café for about 45 Minutes. We were told we had to get off the bus. The only place we could sit was in the Café where you are pressured to buy food and drink. This must have been another commission stop! We arrived In Siem Reap about 6pm. We were dropped off in a field (apparently Siem Reap bus station) where there were 5 Tuk Tuk (Taxi’s) waiting for us. The host on the bus directed us all to our Tuk Tuk. The host had been talking to us on the bus, telling us that when we get to the bus station a Tuk Tuk will take us to find a hotel and also organise a tour of Angkor Temples for us. We didn’t fancy paying for a Tuk Tuk and being hassled like this. So we decided to try and make our own way. We saw a sign saying Siem Reap Centre so headed towards that. We were in a built up area within 20 minutes of walking. We finally found our guesthouse and checked in to our room. We are staying in Ta Som Guesthouse in Siem Reap. It costs $12 a night. The room is a good size and very comfortable. It also has Wifi and breakfast is included. It was hard work getting here, with all the hassle from people, however Siem Reap is a very nice city and the Angkor Temples are more than stunning. We will write all about our adventures around the Angkor Temples in our next Blog. Will power to not give in to touts and people who will try and con you!